CoFlex NL Cohesive Flexible Bandages is self-adhesive - no clips or fasteners needed. Maintains consistent compression with nonslip support. 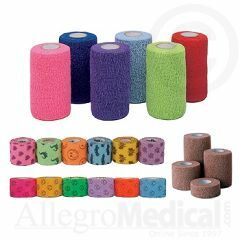 Applied properly, Co-Flex is an excellent pressure bandage that won't cut off circulation. Thin, lightweight and porous, this nonirritating wrap allows skin to breathe while the wound heals. Comfortably adapts to the most difficult body contours. Absorbs energy shocks from strenuous activity and retains its tensile strength longer than cotton bandages. Five-yard rolls. Co-Flex NL Physician's Pack: features convenient exam room boxes for easy dispensing. Available in Tan only. 5 yds. per roll. Long Term Use. Keep In The Medicine Cabinet. Emergency Preparedness. Keep In The Trunk. Outdoor Activities. this product is a great quick fix for a cut that you can not get attention to right away. it is super strong. all of my team loves this product for border line major cuts. Long Term Use. Quick Fix. After burning my leg (I am a quadriplegic), I was having difficulty keeping my dressing in place. The CoFlex not only kept it in place, but did not irritate my skin and was easy to remove. I would recommend this product to anyone that has trouble with standard medical tape. Asked on Mar 29, 2013 1:33:20 PM by Tazz from Danville, AL.